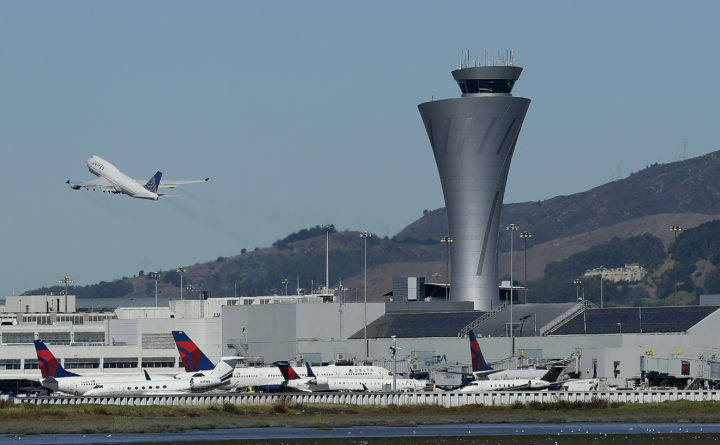 The air traffic control tower is in sight as a plane takes off from San Francisco International Airport in San Francisco, Oct. 24, 2017. Before Corey Soignet had hundreds of lives in his hands, hour after hour, in the airspace above Houston’s George Bush Intercontinental Airport, he spent years guiding military aircraft. He had joined the Air National Guard with an eye toward becoming a pilot, but he found being an air traffic controller such meaningful work that he made it his career. He’s learned the “hyperfocus” needed to help guide aircraft through night skies and brutal storms. On Thursday, Soignet — with 22 years of experience working for the military and Federal Aviation Administration — got a look at his wages for the past two weeks of work helping keep U.S. skies and travelers safe. His net pay? $0.00. “In all that public service, this is the first time I’ve received a pay stub with zero on it for work completed,” Soignet said. And there’s no sign of when that will change. It was an experience shared by air traffic controllers across the country, who visited employeeexpress.gov to find their latest payroll updates. There, along with the mundane health and withholding information on their Department of Transportation Earnings and Leave Statement is a small box with the words “Net Pay” highlighted in blue. More than 24,000 FAA employees are working without pay, since their positions are considered vital for “life and safety.” Another more than 17,000 have been furloughed, told to stop doing their jobs, including the vital training work to bring air traffic controllers into the workforce after years of retirements have thinned the ranks. Air traffic controllers describe an extraordinary pride in their work, tied to the stakes of what they do. Soignet says he thinks of his family flying. “It has to be the right decision at the right time. If it’s a bad decision, the risks are tremendous,” he says. But it will haunt his crucial rebuilding time when he’s home, he said. “You’re taking that time you can decompress and now there’s another external factor: When am I going to get paid?” Soignet said. “It puts a tremendous amount of stress in a system that doesn’t need any more stress,” Andrew LeBovidge, a regional vice president with the National Air Traffic Controllers Association, said. Soignet, who also serves in the controllers union, said there are many federal employees who are worse off than his family, since his wife’s income will help cushion them for some time. He’s put money aside for years. But with spending on a relocation, medical bills and life expenses, “I don’t have savings for six months of my income,” Soignet said. “When it comes to border security, it’s a discussion that needs to be had. But federal employees shouldn’t be used as a bargaining chip,” he said.